When a Manhattan real estate agent witnesses a murder, she joins the Federal Witness Protection Program and starts a new life in Minnesota. A young woman, seemingly good but still psychologically disturbed from being kidnapped as a little girl, becomes the obvious suspect in a murder. A psychologist uses her call-in radio show to help lonesome women but finds out about a killer and when she delves deeper she becomes the next victim. When the best friend of talk-show producer Darcy Scott is murdered while preparing a report about internet dating, Darcy sets out to discover who the killer is, convinced it's one of the men her pal met online. Charged with investigating the suicide of a pregnant woman, prosecutor Kate DeMalo unwittingly becomes entangled in a complex mystery involving cheating husbands, strange doctors and murder. An aspiring actress working for a courier service gets involved in the disappearance of her co-worker. Based on the novel from award winning, best selling author Mary Higgins Clark. 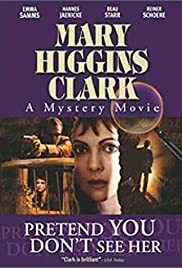 Based on the novel by award winning, best selling author Mary Higgins Clark. A young woman must identify the body of her exact double and ends up discovering the details of her father's death. Heather Greco: Mum, just being here with you like this. I feel better already. Chantal Greco: Oh what I would've given to hear that from you when you were sixteen. Heather Greco: Well you handled the troubled teen pretty well. Chantal Greco: [laugh] Maybe it looked that way, I just remember it as controlled panic. Heather Greco: I don't know, eh, maybe that's why I had to see you today. I mean maybe that troubled teen is not far off. Chantal Greco: What's the matter? Heather Greco: Nothing. It's complicated. Absolutely Fabulous Movie! It made me cry, smile and laugh! A very well put together movie! I've been looking forward to this movie for a few months now. I first heard about it on young Dani Bouffard's (Bonnie) fan club. The movie was very well written and interesting. The acting was superior! Dani showed a great reach of emotion and touched my heart in many scenes. The scene in the hospital and on the phone with Lacey was very touching! When Bonnie was shot at, it was so believable and powerful that during the commercials, I was praying that Bonnie was okay! I think this little girl has a very bright future ahead of her, as I heard she was voted Sweetheart Of The Year for 2001 by the fans! Outstanding job to those who chose Dani for this wonderful role! 29 of 50 people found this review helpful. Was this review helpful to you?